United Nations– India has ratified the World Trade Organisation’s (WTO) Trade Facilitation Agreement (TFA), which could further “its integration into the global economy” by boosting trade through efficient movement of goods. 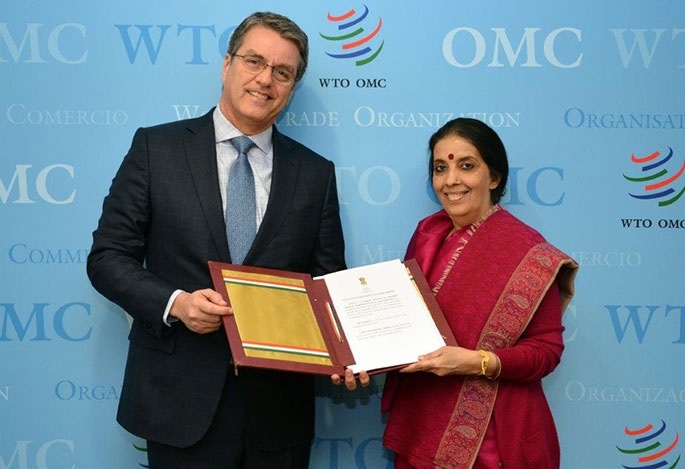 India’s Permanent Representative to the WTO, Anjali Prasad, formally presented the instrument of acceptance ratifying the agreement to WTO Director General Roberto Azevedo on Friday in Geneva. India is the 76th WTO member to accept the TFA, which will enter into force once two-thirds of WTO 162 members formally accepted the Agreement. The TFA was agreed upon at the WTO Ministerial Conference in Bali in 2013. The agreement aims at expediting the movement and clearance of goods, including goods in transit and establishing effective cooperation between customs and other authorities on trade facilitation and customs compliance issues.